Discover how a dental implant can renew your smile with the help of Dr. Maher Barsoum. If you have an unsavable tooth or root due to fracture or decay, Dr. Barsoum can place a dental implant AT THE SAME TIME of the tooth extraction. The fee for tooth replacement with dental implants depends on several factors, including the number of teeth being replaced and the number of dental implants required to support your replacement teeth. Some additional procedures may be required prior to the placement of your dental implants to ensure the long-term health of your dental implants. To obtain a specific fee estimate, it is necessary to have Dr. Barsoum examine your mouth. After a thorough diagnostic examination, he will recommend the treatment that is best for you. Call to schedule a free consultation. Occasionally, older patients express concern to Dr. Maher barsoum that their age may prevent them from enjoying the benefits of dental implants. However, health is more of a determining factor than age. If you’re healthy enough to have a tooth extracted, you’re probably healthy enough to receive dental implants. Certain chronic diseases may contraindicate dental implant treatment. Dr. Barsoum will determine if you are a candidate for dental implants after a careful evaluation of your dental and health history. Dental implant-supported replacement teeth look, feel and function like natural teeth. This means that you can eat and drink whatever you choose. 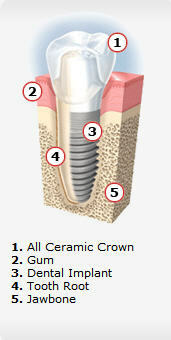 But most importantly, dental implants placed by Dr. maher Barsoum often improve quality of life in a very concrete way. People who have felt embarrassed and worried because of their tooth problems are often overwhelmed by what new permanent teeth can do for their self-esteem. The conventional process can take from three to six months. First, Dr. Maher Barsoum places the dental implant, which is left for three to six months to heal and integrate with the jawbone. During the healing period, your are given a temporary prosthesis until the permanent crown is put in place. The procedure chosen depends on several factors, such as your dental health, the number of teeth involved and which teeth are replaced. These factors will also determine the total number of visits to Dr. Barsoum throughout the treatment period. With any surgery, there can be some discomfort. Anesthesia and patient sedation are commonly administered to help reduce any discomfort during the dental implant process. Most guests report that they were much more comfortable following the procedure than they had anticipated. Dr. Maher Barsoum will prescribe medications to ease any discomfort that may occur. Ask Dr. Barsoum to recommend another patient who has already had tooth replacement therapy to assess their personal experience. If you have any questions about Dental Implants, please contact Dr. Maher Barsoum at his Chino or Upland office or make an appointment on-line . The new office was beautiful. They hygienist was awesome and very informative. Dr Barsoum and his staff were very professional and kind. The whole staff is very friendly. I've had bad dentist experiences in the past but I definitely will continue to come back here. And I will refer all my friends and family here!